تولید زعفران، با ارزش‌ترین گیاه دارویی و ادویه‌ای شرق ایران، تحت تأثیر بیمارگرهای مختلفی قرار می‌گیرد. این تحقیق با هدف جداسازی، شناسایی و بررسی بیماری‌زایی جدایه‌های Alternaria alternata به‌عنوان عامل پوسیدگی کورم و برگ گیاه زعفران، در سال‌های 94-1393 با نمونه‌برداری از خاک و بافت‌های گیاهی نواحی مختلف دشت بیرجند صورت گرفت. جدایه‌های قارچی به کمک محیط کشت عصاره سیب­زمینی دکستروز آگار جداسازی و خصوصیات ریخت‌شناسی آن‌ها بر روی محیط کشت سیب­زمینی هویج آگار بررسی شد. دی­ان­آی ژنومی جدایه‌های قارچی به روش CTAB استخراج و زیر واحدهای ریبوزومی به کمک آغازگرهای ITS1 و ITS4 تکثیر گردیدند. آزمون بیماری‌زایی جدایه‌ها بر روی گیاه زعفران به سه روش تلقیح برگ‌های بریده‌شده، تلقیح کورم زعفران در شرایط آزمایشگاهی و تلقیح گیاه زعفران درون گلخانه انجام شد. بر اساس خصوصیات ریخت‌شناسی، 80 جدایه A. alternata در این تحقیق از دشت بیرجند شامل شهرستان­های بیرجند، خوسف و سربیشه جداسازی گردیدند. در آزمون‌های بیماری‌زایی، پس از 3 تا 5 روز، برگ‌های بریده‌شده در محل تلقیح ابتدا کلروز و سپس نکروز بافت­ها مشاهده گردید. کورم‌ها در محل تلقیح پوسیده‌شده و برگ‌های گیاهان تلقیح­شده در گلخانه نیز دچار زردی و خشکیدگی شدند. شدت پوسیدگی و توسعه آن در جدایه‌های مختلف تقریباً یکسان و پس 5 از روز غده‌های آلوده، پوسیده­شده و بافت برگ­ها نکروزه گردیدند. توالی ناحیه ITS جدایه‌­ها 100 درصد با توالی جدایه‌های A. alternata بانک ژن شباهت داشتند و در شجره فیلوژنتیکی با آن‌ها در یک گروه قرار گرفتند. نتایج این تحقیق نشان داد که A. alternata پتانسیل ایجاد پوسیدگی کورم، لکه­برگی، کلروز و نکروز برگ‌های زعفران را در صورت وجود شرایط بیماری‌زایی، دارا است. این تحقیق اولین گزارش از بیماری‌زایی این قارچ روی بافت‌های مختلف زعفران در شرایط آزمایشگاهی و گلخانه است. Saffron is one of the most important herbs and spices in the East of Iran and its production is affected by various pathogens. This study is aimed at isolation, identification and pathogenicity detection of Alternaria alternata isolates as leave spot and corm rot of saffron agents. Soil samples and infected plant tissues were collected from different areas of the Birjand plain (Birjand, Khusf and Sarbishe) during the years 2014-15. Alternaria species were isolated by potato dextrose agar medium and their morphological characteristics were studied on the potato carrot agar medium. For molecular studies, genomic DNA was extracted by the CTAB method and ribosomal subunits of fungal isolates were amplified using ITS1 and ITS4 primers. Based on morphological characteristics, 80 isolates of A. alternata were isolated. The ITS regions sequences of selected isolates had 100 similarities with A. alternata spices sequences in NCBI and MycoBank. These isolates caused chlorosis and necrosis on detached leaves, the inoculated corm was rotten and inoculated plants showed chlorosis and necrosis on leaves after 3-5 days. The results showed that A. alternata in the Birjand plain can cause corm rot and leaf chlorosis and necrosis is saffron. 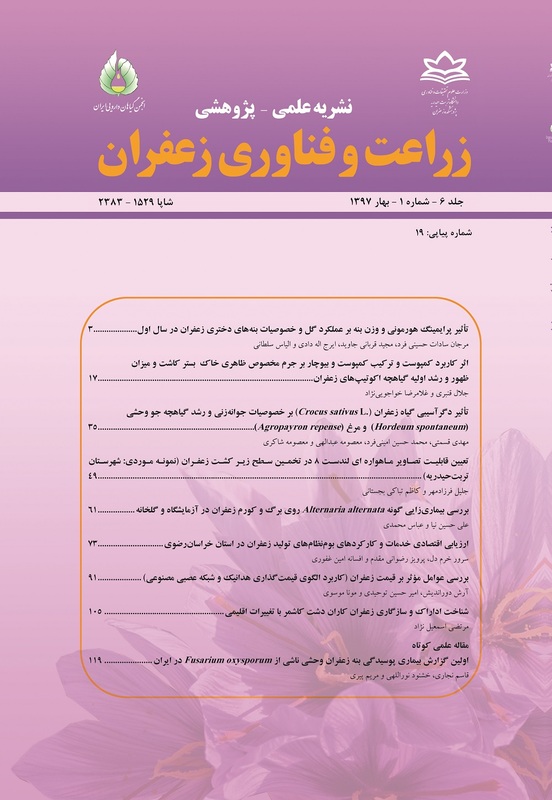 This study is the first report of the virulence of this fungus on saffron tissue in the East of Iran. Ahrazem, O., Rubio-Moraga, A., Castillo-López, R., Trapero-Mozos, A., and Gómez-Gómez, L. 2010. Crocus sativus pathogens and defence responses. Functional Plant Science and Biotechnology. Global Science Book Isleworth, UK, p. 81-90. Akimitsu, K., Peever, T.L., and Timmer, L. 2003. Molecular, ecological and evolutionary approaches to understanding Alternaria diseases of citrus. Molecular Plant Pathology 4: 435-446. Anonymus. 2014. Iran Agriculture Statistics (Vol. 2). Ministry of Jihad-Keshavrzi, Iran, 421 pp. Atlas, R.M. 2010. Handbook of Microbiological Media. CRC press. Di Primo, P., and Cappelli, C. 2000. Preliminary characterization of Fusarium oxysporum f. sp. gladioli causing Fusarium corm rot of saffron in Italy. Plant Disease 84: 806-806. Droby , S., Dinoor, A., Prusky, D., and Barkai-Golan, R. 1984. Pathogenicity of Alternaria alternata on potato in Israel. Phytopathology 74: 537-542. Foolad, M., Ntahimpera, N., Christ, B., and Lin, G. 2000. Comparison of field, greenhouse, and detached-leaflet evaluations of tomato germ plasm for early blight resistance. Plant Disease 84: 967-972. Griffiths, L.J., Anyim, M., Doffman, S.R., Wilks, M., Millar, M.R., and Agrawal, S.G. 2006. Comparison of DNA extraction methods for Aspergillus fumigatus using real-time PCR. Journal of medical microbiology 55: 1187-1191. Hassan, M., and Devi, L.S. 2003. Corm rot diseases of saffron in Kashmir valley. Indian Phytopathology 56: 122. Hong, S.G., and Pryor, B.M. 2004. Development of selective media for the isolation and enumeration of Alternaria species from soil and plant debris. Canadian journal of microbiology 50: 461-468. Houbraken, J., Due, M., Varga, J., Meijer, M., Frisvad, J.C., and Samson, R.A. 2007. Polyphasic taxonomy of Aspergillus section Usti. Studies in Mycology 59: 107-128. Kalha, C.S., Gupta, V., Gupta, D., and Priya, S. 2007. First report of sclerotial rot of saffron caused by Sclerotium rolfsii in India. Plant Disease 91: 1203-1203. Mohammadi, A., and Amini, Y. 2015. Molecular characterization and identification of Acrostalagmus luteoalbus from saffron in Iran. Agriculture Science Developments 4: 16-18. Najjar, S. 2016. Taxonomic study of Aspergillus species associated with soil, crops and horticultural plants in Birjand plain. Department of plant protection,University of Birjand, Birjand, Iran. (In Persian with English Summary). Negbi, M. 2003. Saffron: Crocus sativus L. CRC Press. Noorbakhsh, R., Bahrami, A.R., Mortazavi, S.A., and Bahreini, M. 2009. PCR-based identification of aflatoxigenic fungi associated with Iranian saffron. Food Science and Biotechnology 18: 1018-1031. Palmero, D., Rubio-Moraga, A., Galvez-Patón, L., Nogueras, J., Abato, C., Gómez-Gómez, L., and Ahrazem, O. 2014. Pathogenicity and genetic diversity of Fusarium oxysporum isolates from corms of Crocus sativus. Industrial Crops and Products 61: 186-192. Raeder, U., and Broda, P. 1985. Rapid preparation of DNA from filamentous fungi. Letters in Applied Microbiology 1: 17-20. Raj, P., Khan, S.S., Modak, M., Lone, Z.A., Rather, S.A., and Yaqoob, M. 2013. Biodiversity of endophytic fungi in saffron (Crocus sativus) and antimicrobial activity of their crude extract. IAJPR 3: 3702-3713. Samson, R.A., Hoekstra, E.S., and Frisvad, J.C. 2004. Introduction to food-and airborne fungi. Centraalbureau voor Schimmelcultures (CBS). Sharma, P., Sharma, S., and Sindhu, M. 2004. A detached leaf technique for evaluation of resistance in cabbage and cauliflower against three major pathogens. Indian Phytopathology 57: 315-318. Simmons, E.G. 2007. Alternaria: An Identification Manual. CBS fungal biodiversity centre, Netherlands. Tamura, K., Stecher, G., Peterson, D., Filipski, A., and Kumar, S. 2013. MEGA6: molecular evolutionary genetics analysis version 6.0. Molecular biology and evolution 30: 2725-2729. Templeton, G. 2013. Alternaria toxins related to pathogenesis in plants. Microbial toxins 8: 169-192. Thakur, R., Singh, C., and Kaul, B. 1992. First report of corm rot in Crocus sativus. Indian Phytopathology 45: 278. Wani, M.A.S., and Dar, G. 2004. Studies on Corm Rot of Saffron (Crocus sativus L.). University of Kashmir. Woudenberg, J. 2015. Restyling Alternaria. Phytopathology,Wageningen University. Zadoks, J.C. 1981. Mr. DuHamel's 1728 treatise on the violet root rot of saffron crocus: physical explanation of a disease that perishes several plants in the Gastinois, and saffron in particular. Landbouwhoge school, Wageningen.